Cailliea dichrostachys Guill. et al., Cailliea nutans (Pers.) Skeels, Dichrostachys cinerea subsp. lugardae (N. E. Br.) Brenan & Brummitt, Dichrostachys cinerea var. hirtipes Brenan & Brummitt, Dichrostachys cinerea var. lugardiae Brenan & Brummitt, Dichrostachys forbesii Benth., Dichrostachys glomerata (Forssk.) Chiov., Dichrostachys nutans (Pers.) Benth., Dichrostachys nutans var. setulosa Welw. ex Oliv., Dichrostachys nyassana Taub., Dichrostachys platycarpa Welw. ex W. Bull, Mimosa cinerea L., Mimosa glomerata Forssk., Mimosa nutans Pers. Sicklebush (Dichrostachys cinerea (L.) Wight & Arn.) is a thorny, semi-deciduous to deciduous leguminous shrub that can reach a height of 3-7 m (Orwa et al., 2009; Göhl, 1982). Sicklebush has an open round crown, 3 m wide (SANBI, 2011; Orwa et al., 2009), a deep tap root and many lateral horizontal roots that make eradication difficult (US Forest Service, 2011). The bark is green when young and becomes grey-brown and fissured as the tree grows. The stem is less than 23 cm in diameter (SANBI, 2011; Orwa et al., 2009). The branches bear strong, long (8-10 cm), slightly recurved woody thorns (SANBI, 2011). The leaves are petiolated, bipinnate, bearing 4-19 leaflets (Orwa et al., 2009). The inflorescence is a fragrant, cylindrical 6-8 cm long bicoloured spike that bears reddish-purple sterile flowers in the upper part and pale yellow-cream fertile ones in the lower part (Orwa et al., 2009). 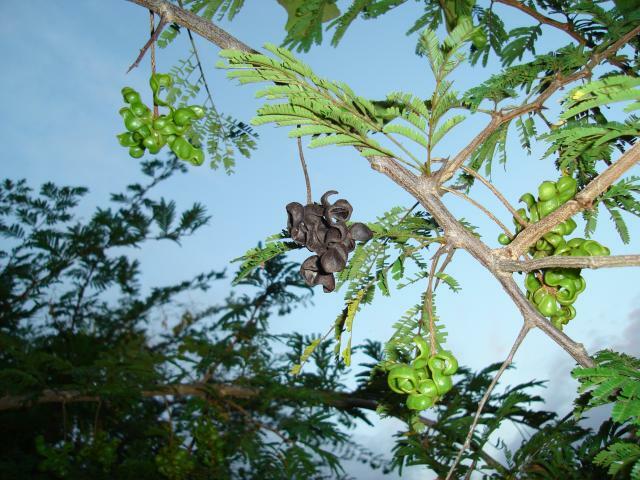 The fruits are narrow, 10 cm long indehiscent pods, yellow or brown, twisted or sickle-shaped (hence the name "sicklebush"), borne in clusters (Göhl, 1982). The pods contain 4 seeds (Orwa et al., 2009). 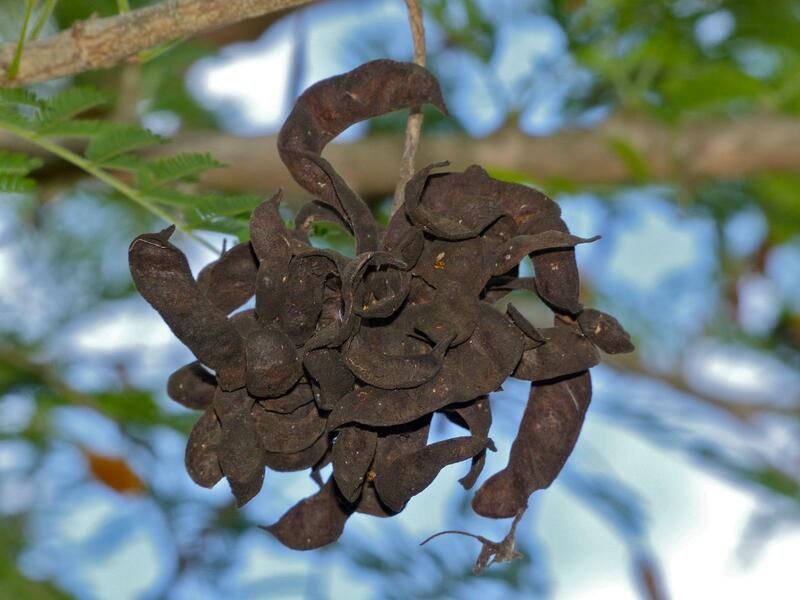 Dichrostachys cinerea is a multipurpose tree and its pods and seeds are edible (Ecocrop, 2011). The wood is heavy and termite-resistant and is thus used to make posts and fences. It can be used for fuel since it makes no smoke and burns slowly. The bark is fibrous and used for twine (Orwa et al., 2009). Sicklebush also provides several environmental services (see Environmental impact below). The leaves and fruits are relished by wild and domestic ruminants (Aganga et al., 2007). The pods ripen during periods of scarcity. They are indehiscent and can be stored without any problem (Mlambo et al., 2004), making sicklebush a valuable fodder in dry areas (FAO, 2011). It is well suited for silvopastoral systems since it can be intercropped with grasses and legumes such as buffel grass (Cenchrus ciliaris), sewan grass (Lasiurus scindicus) and caribbean stylo (Stylosanthes hamata) (Orwa et al., 2009). Sicklebush is sometimes a source of conflict between pastoralists and charcoal producers (Kavana et al., 2005). Dichrostachys cinerea originated from Africa and spread to many tropical areas in Asia, Australia, America and the Caribbean. It is found in frost-free areas on poor soils, fallows and degraded lands (FAO, 2011). Though it is drought-resistant and can be found in regions with 200-900 mm annual rainfall, it tends to be restricted to watery places near ponds and along water courses in the Sahel (Ecoport, 2011). It grows on many types of soils, including lateritic or clayey soils. It is tolerant of fire but does not stand waterlogging (Ecoport, 2011; FAO, 2011). Dichrostachys cinerea is considered to be an invasive species, notably through bush encroachment, the ecological process in which a grass-dominated community is changed into a woody community. Encroachment is the result of overgrazing and is attributed to the ability of Dichrostachys cinerea to regenerate from seeds and root buds. Grazing by goats may help to control its development (Ecocrop, 2011; Yayneshet et al., 2008a; Tolsma et al., 1987). In the West Indies, Dichrostachys cinerea has been responsible for the invasion of rangelands and has caused significant agricultural production losses. It is now considered a risk in places with similar climates such as Hawaii or South America (SANBI, 2011). The roots fix atmospheric nitrogen and the leaves are frequently used as a green manure. Dichrostachys cinerea is widely used for sand dune stabilization and soil conservation. It is useful for revegetation and intercropping (Ecocrop, 2011). Dichrostachys cinerea is also as an ornamental plant and makes efficient defensive live fences (FAO, 2011). Dichrostachys cinerea has a relatively high protein content (9-19% DM) and may be an alternative source of crude protein and/or indirect microbial protein (Feedipedia, 2011; Choongo et al., 2008). Its nutritive value varies widely between seasons and depends on temperature and rainfall. For example, in Botswana, DM content might be only 43% in the wet season (March to May) and increases up to 74% in the dry season (July to September) (Aganga et al., 2005). The DM content can be influenced by the soil composition (Aganga et al., 1994; Tefera et al., 2008). The tannin content of Dichrostachys cinerea decreases its in vitro digestibility (Tefera et al., 2008). However, tannins exert a positive influence on protein utilization by protecting them from excessive rumen degradation and promoting post-rumen digestion. Tannins have a defaunating action and diminish the number of protozoa by entrapping them into mucilage. Protozoa will eventually die within the mucilage or flow with the digesta where they will be killed in the acidic medium of the abomasum. The decrease in the number of protozoa will favour the increase in bacteria, and hence the microbial protein available to the animal (Choongo et al., 2008). The need for tannin inactivation throughout the use of NaOH, PEG or by soaking in aqueous wood is still discussed: it is considered useless in some cases (Mlambo et al., 2004) and effective for increasing in vitro digestibility in other cases (Smith et al., 2005). For instance, inclusion of the PEG in tannin-rich feeds caused an increase in gas production, suggesting an increase in organic matter digestibility, but apparent and true digestibilities were lower on addition of the PEG, due to the presence of PEG-tannin complexes in the residues (Makkar et al., 1995). Thorns may injure animals and have been reported as a major problem for cattle in some countries. In the Caribbean Islands, a mycotic dermatosis due to the bacterium Dermatophilus congolensis has been linked to wounds caused by the thorns of Dichrostachys cinerea (Esterre et al., 1983). The foliage of Dichrostachys cinerea is rich in tannins and particularly in condensed tannins, which may be detrimental to digestibility (Makkar et al., 1997). However, some authors have considered that the total phenolic content was low enough to be nutritionally safe for ruminants (Matlebyane et al., 2009). Dichrostachys cinerea is browsed during the dry season. Pods, twisted and borne in large bunches, are much relished by cattle and game (Göhl, 1982). 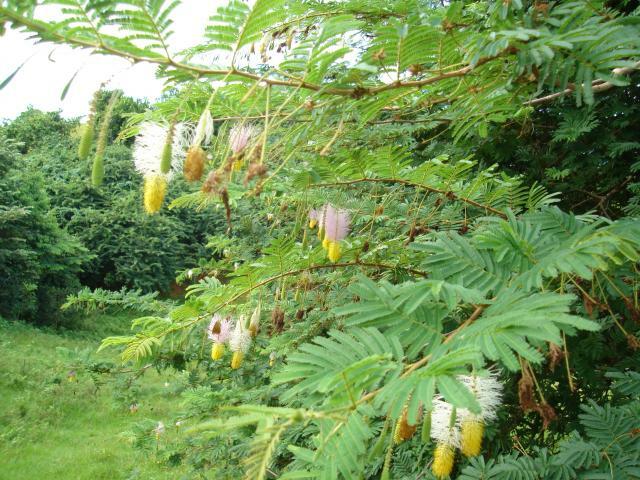 Surveys have shown that Dichrostachys cinerea is well known by farmers in several regions of Sub-Saharan Africa. In South Africa, it was the most known shrub species in the Bushbuckridge area (Chepape et al., 2011) and ranked second as predominant fodder in the Limpopo province (Matlebyane et al., 2010). In Central Tanzania, it was known and used by 40% of respondents (Komwihangilo et al., 1995). 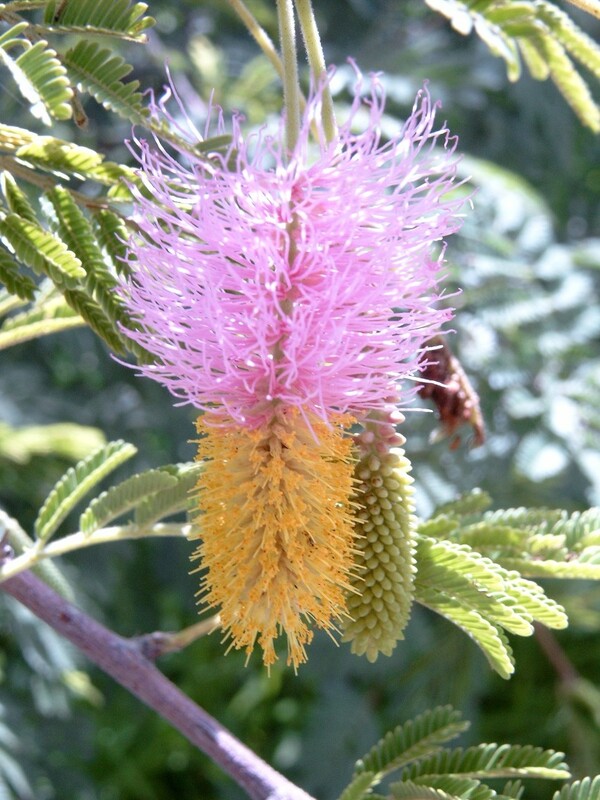 The high protein content of Dichrostachys cinerea browse may alleviate problems of protein shortage during the dry season, when it is fed to goats as a supplement to low quality forages (Aganga et al., 2000; Sharma et al., 1998). It was comparable to alfalfa hay as a supplement to buffalo grass (Paspalum conjugatum) in yearling male goats, which ate more dry matter and drank less than the animals fed alfalfa hay (Aganga et al., 1998). However, a survey of Central Tanzania farmers found that most farmers reported that feeding Dichrostachys cinerea caused goats to consume more water (Komwihangilo et al., 2001). Goats supplemented with sicklebush during the month before kidding had increased milk production, reduced kid mortality, and their kids had higher growth rates and weaning weights (Maphosa et al., 2009). Dichrostachys cinerea can also be included in urea-molasses blocks (Aganga et al., 2007). Dichrostachys cinerea leaves have been found to be very nutritious and constitute the major edible portion of the plant (Tefera et al., 2008). However, the thorns make the leaves difficult to eat for cattle and they tend to avoid them when they have the choice (Aregawi et al., 2008; Moleele et al., 2002). Goats, who have sharper muzzles and can maneuver their mouths between thorns, eat the leaves in spite of the thorns (Aregawi et al., 2008; Sebata et al., 2010). The leaf accessibility index (measured as the ratio between inter-thorn spacing and mean goat muzzle width) of sicklebush was higher than that of Acacia tortilis, but lower than that of Terminalia prunioides (Sebata et al., 2010). Dichrostachys cinerea retains its leaves late in the dry season, which is particularly valuable in periods of biomass scarcity (Aregawi et al., 2008). Their protein content is adequate for maintenance and growth of small ruminants (Tefera et al., 2008). They contain adequate amounts of Ca and Mg but are deficient in K and P (Tefera et al., 2008). Sicklebush pods are well accepted by all ruminant species (Onana, 1995). They contain more protein than the grasses available in the same regions. This cheap protein source can replace commercial protein sources, especially during the dry season (Smith et al., 2005; Mlambo et al., 2004; Shayo et al., 1999). They are a better supplement than Acacia etbaica fruits for fattening young goats (Yayneshet et al., 2008b) and better than Digitaria grasses for yearling Friesian bulls (Choongo et al., 2008). Since the pods are indehiscent, their nutritive value for cattle is improved when they are milled through a 4 mm screen (Mlambo et al., 2004): a larger percentage of intact seeds were found in the faeces of calves (76%) and heifers (67%) than in those of small ruminants (20 to 50%). The beneficial effect of grinding was only effective for cattle (Shayo et al., 1998).